Last week, I was in Boston for work. It’s very rare that I have several nights in a row to myself, so I hardly knew what to do with myself. I can only watch bad TV for so long. A few days before I left, I was scrolling through my suggestions on IG and I found some really cool custom nail art. Upon further inspection, I learned the nail artist was actually located in Boston. A quick DM later, The Nail Art Babe confirmed she was located in Somerville, not too far from my work. I jumped at the chance to have her create custom nail art for me, and I’m so glad I did. I love getting my nails done, but I always opt for a basic gel application. Usually, I choose red nails or something neutral. On a rare occasion, I might choose white or something a little more flashy. I never really considered custom nail art until I realized how much you can express yourself through your nails. It’s like I suddenly had this epiphany that you can totally express your style through hair and nails. I’m not sure why it took me so long, but finally going blonde last fall, it finally hit me how much I can change up my style through my hair, nails and makeup. 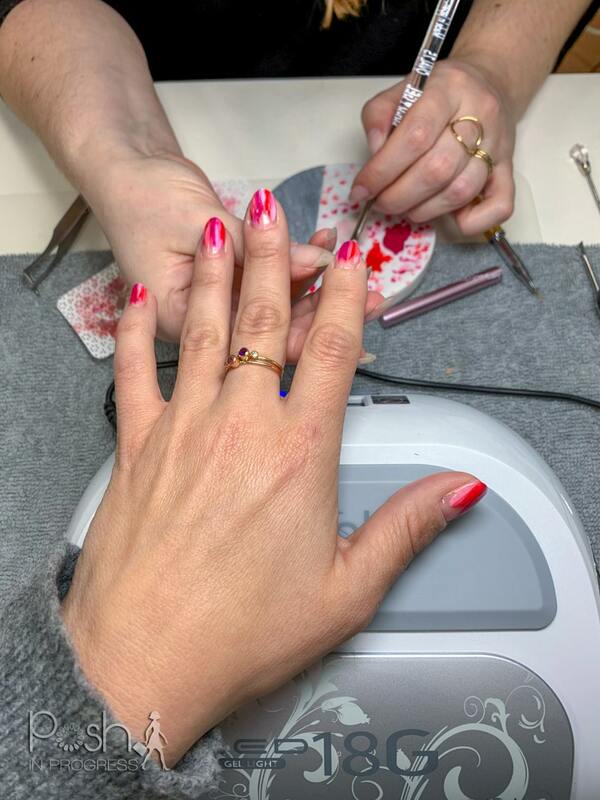 With my newfound interest in nails, when I saw the Nail Art Babe’s work, I thought it would be fun to have my first experience getting custom nail art. 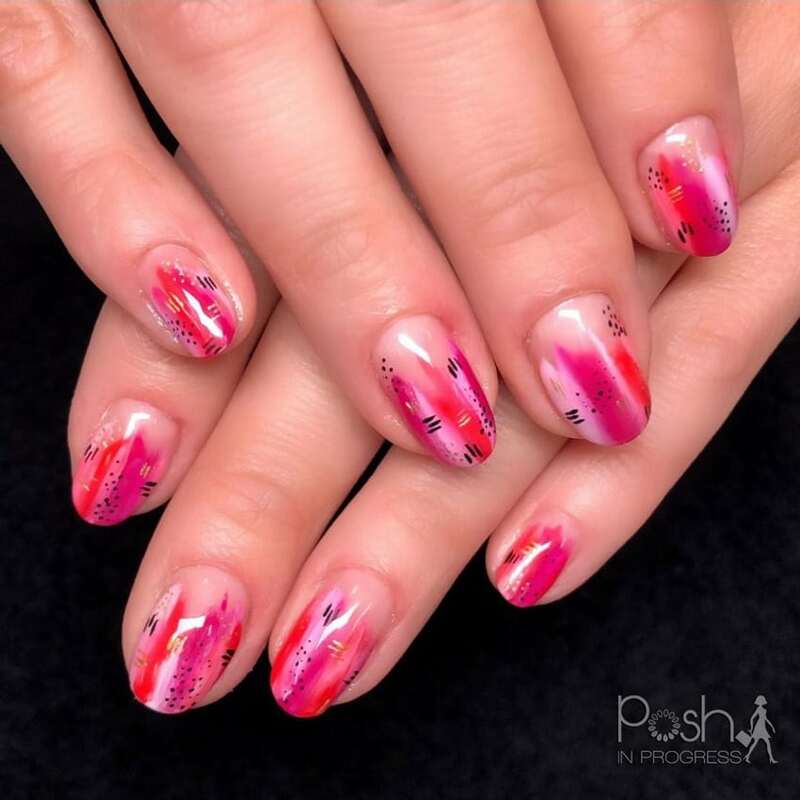 When I arrived, I showed her some images I had saved in my IG of other nail art I loved. She actually knew some of the artists (like this LA-Based one), and I also saved some of her art that I loved most. I explained to her that I wanted to get something that felt Valentines’ Day-inspired without being too cutesy or obvious. (Read a bunch of hearts). At first, she had to remove my old gel. Once that was done, she spent a great deal of time cleaning up my cuticles. She removed a lot of dead skin, which was amazing because it gave a much larger canvas for her custom nail art. I had no idea it would take so long to prep my nails, but she took great care in giving me the cleanest surface for my nails. I 100% believe in letting the artist create. But if your artist is open to feedback, then definitely offer some. She enjoyed the fact that I gave her some suggestions and input so it really felt like a collaboration. Plus, she wanted me to be happy with the final product, so it’s important that I gave her some guidelines. After consulting for awhile, we agreed to use red, pink and a pinkish-purple. I wanted Valentine’s colors, so this was the perfect start. Then, we agreed she would add some gold and black elements too for some visual interest. I asked her to keep the color on the tips and mid-part of my nail. I didn’t want her to go all the way to my cuticles so there wouldn’t be immediate and obvious grow-out. Since I was spending quite a bit more of custom nail art, I wanted it to last longer. During the painting process, I mostly just let her do her thing. Every now and then, she’d ask me a question about how it was coming out. Mostly though, I just let her work and we chatted about other things. Near the end of the process, I did specifically ask her to add a bit more gold and black. 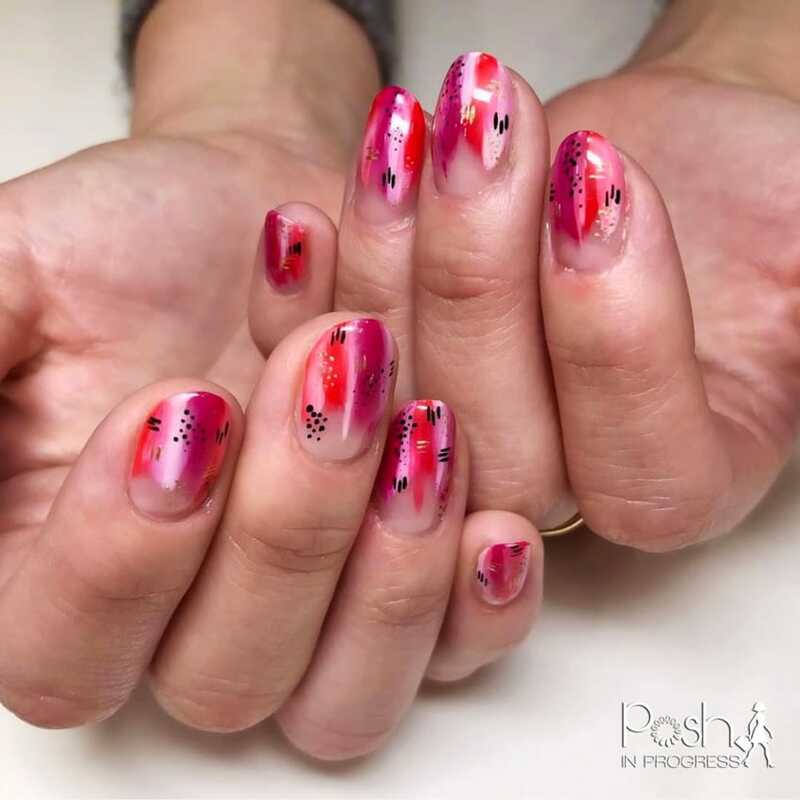 I felt like the nails could use a bit more pattern to them, so she added more dots and lines to finish the look. I had the best time getting my custom nail art done. One thing I wasn’t expecting is just how long it would take. It was much longer than I expected, but you can’t rush greatness. She is a true artist, and creating art takes time. In the future, I could have saved her time by coming with clean nails and better-maintained cuticles. But nonetheless, it was completely worth the time commitment because I LOVE my nails! They are so fun and unique. I can’t believe I’ve waited this long to get custom nail art. I definitely won’t wait this long to get it done again. Plus, the Nail Art Babe has a client every time I travel back to Boston. 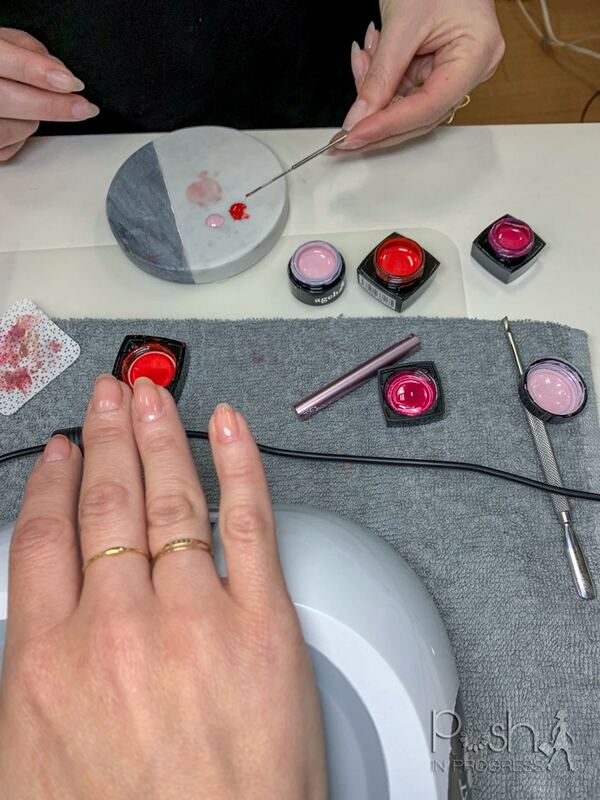 I get my nails done every three weeks by an artist in Calgary, Alberta, Canada. She is so creative and such a perfectionist I come out of there with beautiful nails every time. I feel so lucky that I found her it’s a pleasure to see her every three weeks. That’s so great! Isn’t it the best when you find someone to do your nails (or hair) that you love? !